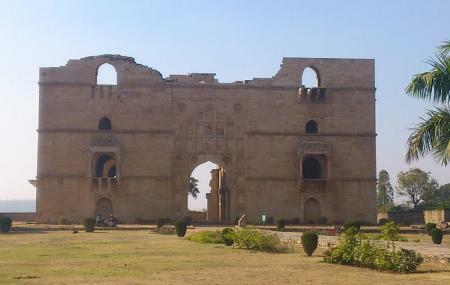 The Koshak Mahal was built in 16th century when Mahmud Khilji of Malwa was passing through the small town and loved this location. Today, the grand structure remains in a beautiful ruin. The originally plan 7-storey building was stripped down to only 2–storeys. Today, the gorgeous arches, symmetrical Afghan style of architecture and a design that supports natural cross-ventilation, makes this place one of the most hauntingly gorgeous sites in Chanderi. How popular is Koshak Mahal? An amazing architecture, sure to visit, well preserved, I have been to places having better things for you to see in India but it's rare to find well- preservation and management. Although ruined somehow, it still manages to get your attention to it's beauty. Koshak Mahal also serves you a fantastic story, pay it an arrival. Nice historical place to spent time & have some unique pictures. This is a Palace with no rooms, only boundaries were constructed. This is incomplete building. This palace was constructed just to give work to unemployed public. No entry fee. Timing from Sunrise to Sunset. Garden is very beautiful and well maintained. Avg spend time is one hour Photographers paradise. It was a very beautiful place which needs the world's attention because very few tourists know about this beautiful town.One must remember one thing while visiting this place there are so many beehives in this palace so please take care while ascending and descending on stairs. At last it was also away from the town near to the ASI museum.